Seattle Times -‘ There aren’t more spiders, they’re just bigger and mature’. – In August of 2010, I spoke with Seattle Times science reporter Sandi Doughton about spiders regarding the apparent population ‘boom’ during the fall. She initially wanted to interview Arachnologist Rod Crawford, but he suggested they visit me too. The article was published in the Sunday paper (on the front page!) and also online. This article would go on to profoundly change my life. About a month after the Seattle Times article was published, I was contacted by Doug Bursch of KGNW, to talk about my “journey from spider fear to spider expert”. I’d never heard of the radio station before, but thought it would be a neat opportunity to share my experience and hopefully reach a swath of the human population I’d never otherwise have contact with. I called in on a Tuesday around 4:19pm (Unfortunately, I just happened to be sick with a cold and had a terribly stuffed up nose…) and tried my best to answer his questions. Rod was interviewed right after me. That was neat and pretty scary! Julie Ray of La MICA Biological Station in El Copé, Panama, asked me if I could volunteer my artistic abilities to assist her with illustrations for her book, The Venomous Snakes and their Mimics of Panama and Costa Rica. I toiled for several weeks, reconstructing coral snakes and their mimics in a plate format. It was very time consuming and challenging work, requiring me to refer to dozens of photos for each snake species, some of which where rare or uncommon, or just poorly represented in photos on the web. The end result was fascinating, and I’m really pleased to have finally accomplished my dream of publishing my artwork. I anticipate more illustration work in the future. This was my first contribution to Julie Ray’s projects, a logo design for Team Snake Panama that is used for various media and projects. Rod Crawford invited me to give a lecture for Scarabs: The Bug Society, where bug and arachnid enthusiasts of all kinds gather for meetings. I was free to choose a topic for my lecture, and I settled on “The Arachnids and Arthropods of Mindo, Ecuador”. On March 26th, 2012 I presented an extensive photo slideshow, using James’s photos from our 2011 Mindo trip. The meeting room was a full house! I’m honestly terrified of public speaking, and this was my first lecture – but it was a great learning experience and was told I’d done a good job. I’d enjoy doing it again! March 23rd, 2015 – I was invited back for a second Scarabs meeting! James joined me this time around and we presented our hour long – ‘Return to Mindo, Ecuador‘, which covered the insects and arthropods of the cloud forest. We had a lot to share! 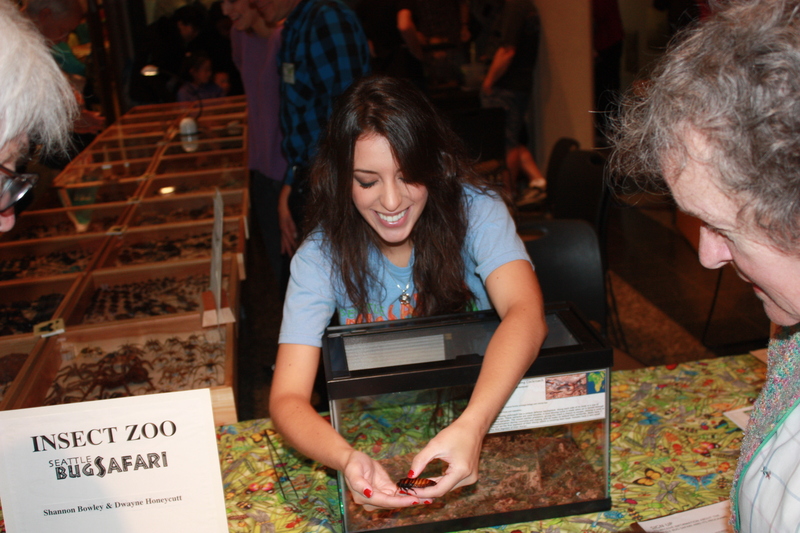 On September 22nd, 2013, I attended Bug Blast at The Burke Museum of Natural History and Culture, representing my former workplace – The Seattle Bug Safari. The Seattle Bug Safari is a traveling bug zoo owned by Brian Rolf. I spent the day educating families about the live bugs we had on display, which included Madagascar Hissing Cockroaches that I’d encourage people to touch! The event was a throng of kids and their parents, as well as curious adults with a passion for entomology and arachnology. Volunteer Work: In March of 2014, I traveled to Panama for a month to do volunteer work as an assistant to herpetologist Julie M. Ray, Ph.D . You can read about that experience here! In May of 2015, after a second successful fundraiser – I will return to Panama for the whole month to do more illustrations of snakes for publications, as well as assisting Julie with tissuing hundreds of DOR (Dead On Road) snakes in her collection. I love what she has accomplished so far and all that she aspires to do! Expanding our knowledge of snakes and doing more to protect and appreciate them, as well as educating the local people who live with them is a noble and difficult task that I am very happy to help her with. Visit the latest Team Snake Panama site to learn more about her work! We will also be collaborating on her second book which will cover all 153 species of snakes in Panama. This is a huge endeavor that requires a lot of time to complete, so if you’d like to donate to help it come to fruition, you can do so here!